During the last decade I have been avidly seeking out and publishing a wealth of correspondence and journals from soldiers who fought in the Revolutionary and Napoleonic wars, 1793-1815. With each new discovery I never cease to be amazed at their general high quality as primary sources, but also how much they alter our ‘perceived version’ of this fascinating period in military history. This has spurred me on to delve even deeper and it has become clear that all of the primary source material that has ever been published is still merely the mere tip of the iceberg and that our understanding of the period is far from complete. Occasionally I am lucky enough to happen upon a very large collection which seriously challenges my abilities and which takes over my life in so many ways. Such is the Clinton archive, which contains correspondence of not only both Henry and William Clinton, both generals during these wars, but also of their father, Henry, so famous to Americans for his role in the War of Independence. I first discovered the Clinton papers at the John Rylands Library in Manchester when actually visiting there regarding another small set of letters when the archivist mentioned them. I was then met with incredulous looks when I then asked to see the Clinton papers to judge their relevance and was informed that there were no less than 130 very large green boxes, each crammed with letters and reports and that they were uncatalogued and in no particular order. This initial probe into a few of the boxes confirmed both the scale of the task, each box containing perhaps five hundred or more letters or reports, some bundled and labelled by the Clintons for ease of identification (although often incorrectly) whilst many more just lay in disorganised piles which proved to be in no particular order at all. From this initial investigation, it was clear that the Clintons never threw anything away and what may have appeared insignificant and would be discarded by most was kept, offering up the possibility of a virtual treasure trove of new information. Undaunted by the sheer volume and excited by the prospect of major discoveries I then arranged to undertake regular visits to the library over the ensuing months to methodically search each box and to photograph all relevant material, which could then be worked on in greater comfort at home. Given the huge scale of the task and my then current publishing project, the Waterloo Archive series, which has mushroomed from a single volume to six in the last few years, I began by searching out all material relevant to the Waterloo campaign thinking to incorporate it within this series. However, it soon became very obvious that the amount of material, even on this short period, was voluminous and would require publication separately. Over the next few months I accumulated over 7,000 photographs of documents and it has taken a few years to work my way through all of this material. But this monumental task did not end there! Searching for information regarding the Clinton brothers I discovered that when the family papers had been auctioned in 1958, that they had unfortunately been sold in lots and that another very significant collection of papers from the family were held at the Beinecke Library at Yale. Following a lengthy correspondence with the staff at Yale I was able to obtain photographs of the relevant material held there as their collection had fortunately been catalogued and this produced another 3,000 photographs of documents. I have over the last few years worked diligently to transcribe all of this material and this two volume set, containing some 240,000 words is the culmination of all of this. It contains all of the correspondence written to and from Sir Henry Clinton between August 1814 when he was appointed second in command, or senior British officer, to the small British/Hanoverian army which served as a defence force for the newly liberated country under the command of the hereditary Prince of Orange. As such Henry Clinton performed the role of Inspecting Officer for all the troops in Belgium including the fledgling Belgian and Dutch units and as such he is a vital witness to the quality and training of all of these troops and to the massive repair programme to the main border fortresses in the run up to the Waterloo campaign. With Napoleon’s return to power and the mobilisation of the army for war once again, Henry Clinton was then appointed by the Duke of Wellington to command the Second Division, consisting of Adam’s British Light Infantry Brigade, Du Plat’s Brigade of King’s German Legion troops and Halkett’s Brigade of Hanoverian troops, a very diverse group with varying degrees of experience, equipment and training. His correspondence most importantly is written contemporaneously and gives honest assessments regarding the strengths and weaknesses of all of these troops and is both enlightening and often surprising. Those claiming almost superhuman powers for the 95th Rifles, 52nd Foot and German Legion troops, who rightly stand proud as superb regiments with immense achievements during the Peninsular War will see that the loss of many experienced men whose period of service had expired, altered their capabilities radically and will find this uncomfortable reading at times. Paradoxically the newly formed and very inexperienced Hanoverian militia troops are described as excellent material and very keen to learn, their performance in battle is fulsomely lauded. In recent years, the age old arguments regarding which regiments should retain the laurels for defeating the Imperial Guard at Waterloo have resurfaced, but perhaps the best judge who is shown to be consistently honest and forthright in his views has not been consulted. 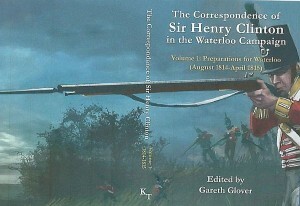 Henry Clinton wrote numerous letters and reports of the actions of his troops at Waterloo and an honest assessment can be more readily gained from his immediate correspondence than from those who wrote decades later with their own agendas. Recently authors such as Nigel Sale have pointed the finger at the Duke of Wellington (an easy target it would seem), for his failure to mention the exploits of the 52nd in the battle, but his arguments can now be reassessed using this newly discovered primary evidence and it seems that the blame has been left at the wrong door. As well as his correspondence, Henry Clinton also kept a personal diary which was completed each evening. All of this various material has been put into date order and each day’s diary entry precedes the correspondence for the day (inserted by date of writing rather than of receipt) and the letters have been put in sequential order wherever it is possible or a time of day is indicated. No changes have been made to the originals with the exception of adding in parentheses missing words which aid our understanding, or unreadable words shown with an additional [?] names of people have been standardised to aid identification. I have also added a very large number of footnotes to aid the reader identify people mentioned and to explain incidents mentioned in greater detail where deemed necessary for understanding. I cannot recommend highly enough the Clinton correspondence to anyone wishing to assess the Waterloo campaign, it will I believe radically change our understanding in many significant ways. This volume in particular deals in detail with the British troops left after Sir Thomas Graham’s exploits in 1814; the fledgling Dutch/Belgian and Hanoverian troops which Henry Clinton also found on his arrival and the K.G.L. troops as they arrived in the early autumn, unsure whether they were to disband and afraid of being sent the Indies, the graveyard of the British army. The efforts to bring these units up to scratch in regard to numbers, equipment, discipline and training are divulged in great detail as are the incessant works to complete the fortified places along the border. Finally with the news of Napoleon’s return to the throne, much is revealed regarding the build up towards war. Anyone who wishes to understand the preparedness of the various national contingents and capabilities of the various troops and commanders, will find this resource of inestimable value.